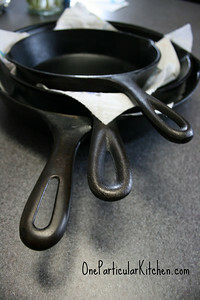 Want to know what happens if you let your cast iron sit around, unused, with a lid fused to the skillet? Allow me to show you. See how pretty and shiny and glossy they are? Teflon has nothing on these. Nothing. Now, here is a skillet and lid that someone gave me recently. Oy. I feared the worst, but tried to attack it on my own. I put the skillet and lid in the oven and turned on the self-cleaning cycle. This baked off all the gunky, sticky seasoning and left me with just rust. 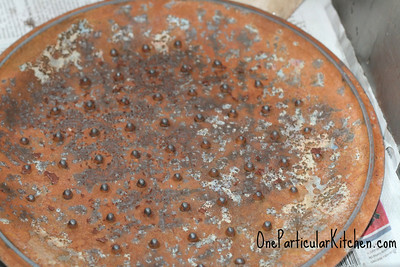 But a lot of rust. Fine-grade sandpaper is no match for this. Next step: finding someone with a sandblaster. Seriously. See? This has become quite the project. Wow, and I thought the ones I had to restore were bad. If it weren’t for that awesome lid, I don’t know that I’d even try with that one. I’m going to try mine with the abrasive wheel attachment for my drill before I take it to be sandblasted. I’ll be taking pictures of the process, so I’ll be posting the results however it comes out. I know… the lid is my only motivating factor. 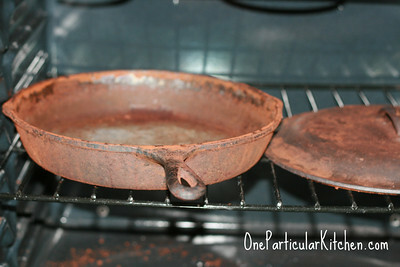 I have another skillet the same size, so I’m having a hard time talking myself into this project. I’m looking forward to seeing how yours comes out with the drill! Did you try electrolysis? That is probably the best move here if you aren’t skittish about gross amounts of electricity coursing through salt water. Ermm…… no? Does it involve me dropping a hairdryer in the bathtub with my skillet? 😉 I kid, I kid!